Nicholle Anderson has been named Hockey Fights Cancer Ambassador while the American Cancer Society, Canadian Cancer Society, and Movember Foundation have been named Official Partners. NEW YORK/TORONTO (Nov. 1, 2017) – Hockey Fights Cancer™, a joint initiative between the National Hockey League Players’ Association (NHLPA) and National Hockey League (NHL) as well as a program of the National Hockey League Foundation and NHL Foundation, begins today. The campaign, which unites the hockey community in support of cancer patients and their families, will feature ceremonies, observances, and fundraising efforts throughout the month of November. All 31 NHL® Member Clubs are designating one home game as the official Hockey Fights Cancer™ in-arena awareness night, with unique programming and partnerships with local cancer organizations. New this season, Nicholle Anderson – wife of Ottawa Senators goaltender Craig Anderson – has been named an official Hockey Fights Cancer ambassador. Nicholle was diagnosed with Nasopharyngeal Carcinoma, a rare form of cancer that effects the nose and throat. Following several months of chemotherapy and radiation treatments, she officially became cancer-free in May 2017. 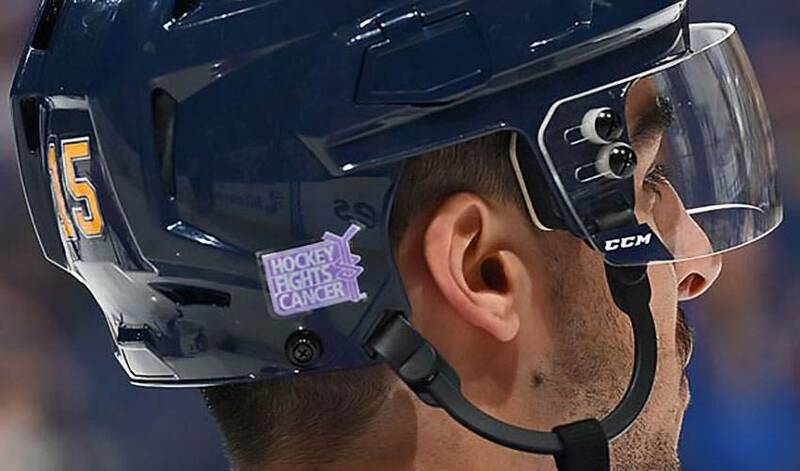 As a Hockey Fights Cancer ambassador, Anderson will be sharing inspirational stories of those impacted by various forms of cancer who are currently undergoing treatment at American Cancer Society and Canadian Cancer Society lodges. These stories and videos will be available on NHL.com, NHL Social, and NHLPA Social platforms. Esteemed national organizations American Cancer Society and Canadian Cancer Society have partnered with Hockey Fights Cancer. For cancer patients, a welcoming, caring environment can help meet the practical and emotional needs of those in treatment far away from home. This season, donations to the National Hockey League Foundation and NHL Foundation through HockeyFightsCancer.com, and proceeds from various campaign efforts, will go toward cancer care including cancer care facilities and supporting patients undergoing treatment. Since 1984, the American Cancer Society has provided more than five million nights of lodging to patients across the country in their Hope Lodge facilities. Today, the American Cancer Society operates more than 30 Hope Lodge facilities across the U.S. and Puerto Rico. In Canada, the Canadian Cancer Society has seven lodges across the country that provide meals, accommodations, transportation, workshops and activities, and support groups for hundreds of cancer patients each day. For the fifth straight season, Hockey Fights Cancer and the Movember Foundation will partner to focus on men’s health. The Movember Foundation, the only global charity focused solely on men’s health – raising funds and awareness for prostate cancer, testicular cancer, mental health and suicide prevention – is asking NHL players to grow a moustache and encouraging fans to get involved. Fans can visit Monetwork.co/NHL to support their favorite NHL team or player, or participate by signing up and raising money for the Movember Foundation with their family and friends. Fans can also donate to the page of legendary moustache owner George Parros, NHL Senior Vice President of Player Safety and longtime supporter of the Movember Foundation. Starting November 13, NHL Network’s NHL Now will feature sit-down interviews with members of the hockey community who have been affected by cancer. Nicholle Anderson will join NHL Network host Jamie Hersch to interview breast cancer survivor Diana Davidson, wife of Columbus Blue Jackets president John Davidson; Craig Snider, son of the late Ed Snider; and New Jersey Devils forward Jimmy Hayes, whose parents are cancer survivors. Throughout the month, NHL Network personalities will wear Hockey Fights Cancer ties and scarves on the air, and the network’s in-studio demo rink will feature lavender dashboards. Fans can get involved by donating online at HockeyFightsCancer.com, share their stories using the official hashtag #HockeyFightsCancer, or purchase Hockey Fights Cancer merchandise at shop.nhl.com. Fans can tune in to national Hockey Fights Cancer broadcast games on NBCSN, Nov. 14 (WSH @ NSH, 8pm ET) and Sportsnet, Nov. 25 (WSH @ TOR, 7pm ET). As part of their Every Save Counts™ initiative, Cigna will continue to donate $1 for every save made during an NHL regular season game and match donations of $25 or more by US donors made online at HockeyFightsCancer.com, subject to a maximum of $100,000.